Once again, we are informing You about the wholesale deal on refurbished appliances. Again, the offer has been presented by the UK wholesaler of new and graded consumer electronics, therefore all UK-based retailers of refurbs and reconditioned electronics should be able to buy the stock at the place. 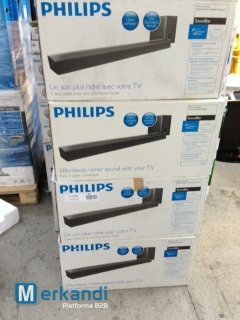 The UK wholesaler has 8999 pieces of Philips wholesale refurbs for sale. Obviously, due to the quantity of the stock, he is willing to sell it in smaller lots. The minimal quantity to take is then 500 units, and probably You will not be able to negotiate a smaller order. After all, 500 pieces is a small amount, if You consider the total quantity of these wholesale refurbs’ lot. Important information for those buyers, who will be considering a reservation of these wholesale refurbs‘ stock or a part of it. The only way to do that, is to contact the wholesaler and making the payment. Once You will provide a payment proof, the stock will wait for You. Regardless of the deals’ basic terms, the products are complete and fully refurbished. Moreover, vast majority of theese brown goods is being sold in original retail boxes. The manifest is available upon request, as well as any other information about the offer, so please call the wholesaler or contact him by mail, if interested in this lot.